Trade-offs are an important part of decision making. If make a change to improve some metric, it is usually at the cost of something else. We have enthroned mark-to-market as a core principle of finance, and we are now seeing what the costs are. If those market prices do not turn around, the only way out is "qualitative easing." There are two principal ways of organising finance in a modern capitalist economy. Bank Finance. Financial intermediaries are banks, and loans are typically held at par on balance sheets (modulo loan loss reserves). Market-Based Finance. Non-bank finance ("the shadow-banking system") in which financial assets are marked-to-market, and banks function as trading intermediaries and as a source of backup credit lines. The disadvantage of bank finance is that over-exuberant pro-cyclical lending creates the well-known problem of zombie banks. Since bank balance sheets are opaque, there is little confidence in them, and the banks slowly liquidate problematic borrowers. Market-based finance is based around transparent pricing and the a priori belief in the effectiveness of market clearing. Zombie financial intermediaries are supposed to be quickly swept away by transparency. Developed world policy makers spent the 1980s and early 1990s dealing with zombie banking systems. Transparent mark-to-market accounting appeared to solve their problems. Unfortunately, they are discovering the down side of the trade-off. Is the explosion in credit spreads the sign of actual problems, or are they just a positive feedback loop within the financial markets? Players with weaker hands are being forced out of their positions, lowering risk asset prices, and then putting the next player in line under pressure. None of this is showing up in U.S. economic data yet; it will only show up when it is too late. However, if the markets reverse course, the positive feedback loop will push risk asset prices in the other direction, and worries about the banking system will look completely unfounded. The beauty of opaque bank loan books is that they only need to be written down when someone actually defaults, and not based on whether some hedge fund trade book blows up. Although Edward Prescott claims that RBC theory has been a success (disclaimer: I have not read this working paper yet, it looks like an interesting read, but I doubt that I will agree with his conclusions) modern macro theory has been spectacularly useless for answering such questions. Providing answers for them is the only thing that matters for monetary policy right now. I suspect many central banks wish that banks still carried massive buffers of government bonds to shore up liquidity concerns, as was the case in the 1950s (chart at top of the article). Those massive Treasury holdings contributed to the financial stability of the 1950s, which created the illusion that Monetarism works (RBC theory being a step-child of Monetarism). As a detached observer with a morbid sense of humour, I find it quite entertaining that fiscal conservatives argued that reducing government debt levels would lower the risk of crisis. 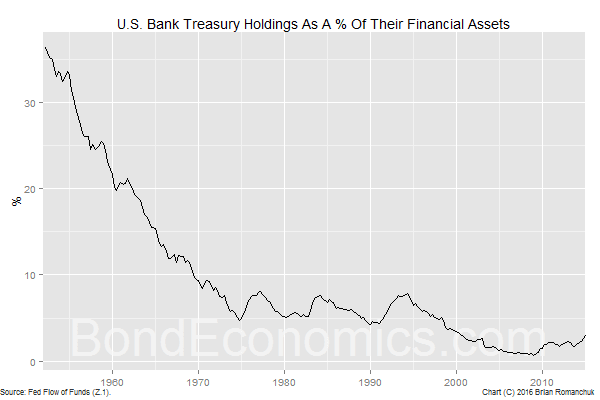 For the time period shown in your graph I would further characterize the liquidity cushion of the aggregate US banks as consisting of at least the following instruments: Treasury securities, Securities issued by Govt Agencies and Government Sponsored Enterprises, and reserves held with the Federal Reserve Bank. A graphs of the liquidity cushion including these assets will show that banks gained reserves and probably Agency/GSE securities in the liquidity cushion after 2009 while non-banks held the major portion of Treasuries. This would be an effective way for Fed and Treasury to provide liquidity while operating under the deficit limits imposed by Congress. Other than Ginnie Mae, Agencies are not directly guaranteed by the U.S. government. This is a deficiency with regards to their usefulness as a position-making instrument in a financial crisis. Reserves are guaranteed, but they cannot be used as a position-making instrument with all non-bank entities (although some non-banks hold balances at the Fed). I recall looking at the liquidity cushion for aggregate bank where I was surprised to see banks holding Agency securities rather than Treasuries. But then I realized that banks were probably earning more interest on the liquidity cushion consisting of interest on excess reserves (above the short term Treasuries rate) and Agency securities (above the rate for similar Treasuries). I concluded that Fed and Treasury figured out how to subsidize the liquidity cushion of the aggregate non-bank and aggregate bank without violating the debt ceiling imposed by Congress. This was accomplished by setting the interest on excess reserves above the short term Treasury rate and by the fact that Agency securities should pay higher interest than Treasuries, and by the fact that bankers are smart enough to know that Treasury was going to put up whatever equity stake required to hold 79% equity in Fannie/Freddie Conservatorship. This is all informal feedback based on recollection, but I think it is accurate picture at some point after the 2008 financial crisis.